Have you ever wanted to be the one who gets to decide just how long, how difficult, how tall, and how challenging your obstacle course is? Now you can. Any of the sections can be used by themselves or they can be added to the other sections to create the perfect obstacle course for you. Choose one, two, three, or even all four sections to come up with just the right amount of challenge and difficulty for your event. Multiple section discount may apply. Click here to see some of the possibilities. Two hours: $200.00 Latest pickup 5 pm. Overnight: $300.00 Set up by 11 am picked up the next morning. 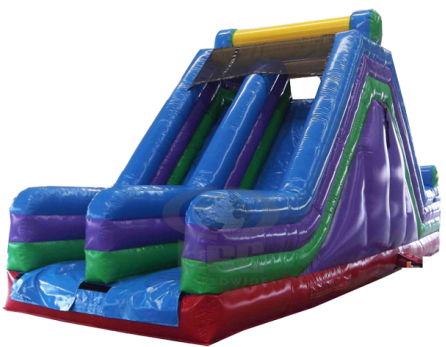 This 30 foot long rock climb slide section features a 16 foot tall rock climb wall and slide. This rock climb wall at 16 feet starts to be a little more challenging than your standard rock climb wall. Our 30 foot rock climb slide section can be used by its self or combined with any of the other sections. Often times it is combined with either the 30 or 40 foot obstacle sections. Great addition to any backyard event, graduation party, or company picnic.